Although vinegar contains few essential nutrients, consuming it may provide you with some health benefits. 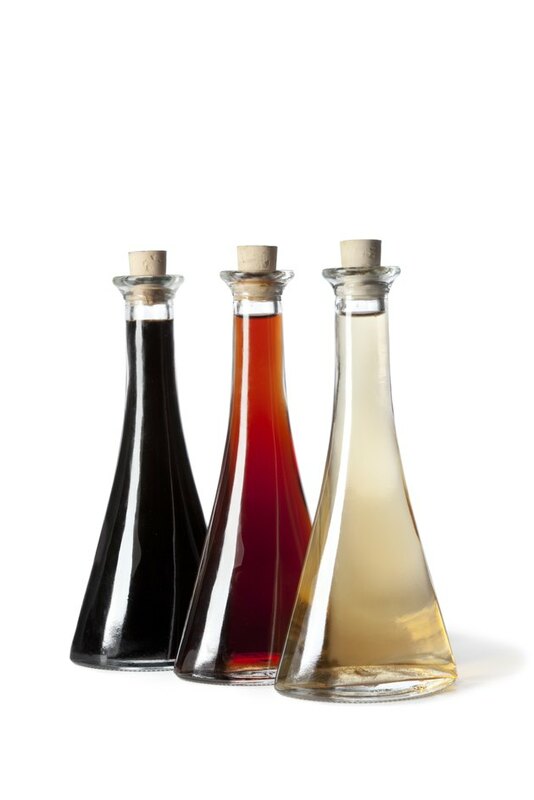 Vinegar aids in healthy weight management when eaten in place of higher-calorie alternatives. Studies published in 2010 in "Annals of Nutrition and Metabolism" and the "Journal of Nutritional Science and Vitaminology" report that ingesting vinegar with complex carbohydrates reduces post-meal blood glucose levels, and balsamic vinegar reduces triglyceride and total cholesterol levels. Vinegar helps enhance the flavor of foods, but it is very low in calories. One tablespoon of balsamic vinegar contains just 14 calories, while a tablespoon of distilled vinegar provides just 3 calories. Using vinegar in place of higher-calorie salad dressings or sauces significantly helps reduce your overall calorie intake, which is beneficial if you're trying to achieve or maintain a healthy body weight. Most of the calories in vinegar are from carbohydrates -- mainly sugars. For example, balsamic vinegar contains no fat, 0.8 grams of protein, 2.7 grams of total carbohydrates and 2.4 grams of sugar in each tablespoon. Distilled vinegar, on the other hand, contains no protein, no fat and just 0.1 gram of total carbohydrates, all of which are from sugar. Vinegar contains no fiber or dietary cholesterol. While vinegar does contain a few select vitamins and minerals, the amount of micronutrients in vinegar is not a significant contribution to your daily vitamin and mineral needs. For example, 1 tablespoon of distilled vinegar provides 1 milligram of calcium and 1 milligram of phosphorous, while 1 tablespoon of balsamic vinegar contains 4 milligrams of calcium, 0.1 milligram of zinc, 18 milligrams of potassium, 3 milligrams of phosphorous, 2 milligrams of magnesium and 0.1 milligrams of iron. Due to vinegar's very low-calorie content, it has been shown to be effective for weight loss in several studies. One such study published in 2009 in "Bioscience, Biotechnology and Biochemistry" found that a daily intake of vinegar significantly reduces body weight, body mass index, body fat, waist circumference and triglyceride levels. However, another study published in 2012 in "Nederlands Tijdschrift Voor Tandheelkunde" reports that ingesting apple cider vinegar daily to achieve weight loss may erode teeth. How Much Cider Vinegar Should You Take to Take to Lose Weight?